Is Osama or Saddam Nostradamus’ Third Antichrist? 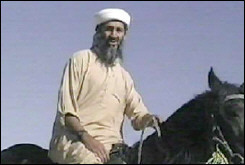 Usama bin Laden (above), Saddam Hussein. Which one is Nostradamus' Arab Prince of Evil? The future and the events they anticipate are having a convergence. The prophecies of Nostradamus about his Third and Final Antichrist, code named Mabus now pit the two front-runners, the late Saddam Hussein and the recently killed Usama (Osama) bin Laden, in an ever-closer race to be number one candidate for Antichrist. Usama is catching up with Saddam. Let us go through the milestones that Saddam and Usama tally up to be candidate number one. (A full examination of all the Nostradamus Antichrist prophecies and potential past and future candidates can be had by reading my e-book. Click on Antichrist. Being a dead candidate is the first and dubious milestone both share. Both violently annihilated: Saddam was hanged at the 30 December 2006, Usama shot by US Navy seals on May Day 2011. Both men’s names can be found in the code name Mabus. Saddam backwards spells maddas=mabbas=mabas. Replace one redundant a and you get Mabus. Usama mixed around get us maaus. Take the b from bin Laden. Replace the redundant a and you get Mabus. The horrible undoing of people and animals has not been made clear. It could imply the times in which they died, when the earth is seeing the balance of nature (animals) unraveling in devastating climate change caused by human abuse of the planet and overpopulation (people). There are many prophecies in Nostradamus about natural disasters, superstorms of terrible winds, global warming, vast inner-continental droughts at latitude 48 degrees across the world, all leading to a global famine and a third world war that may see two-thirds of the human race consumed. It is not made clear in the prophecies if the Antichrist and the war arising from his annihilation triggers this unraveling of civilization and mass animal extinctions from a global catastrophe he caused. Indeed, the fact that Nostradamus does not directly tie the Third Antichrist to nearly 100 prophecies on this theme except for the nebulous connection made in 2 Q62 indicates to me that the unraveling of people and animals describes the times in which the Antichrist’s added catastrophe of a post mortem war takes place. This however does not ignore the potential of either some terrible terrorist reprisal (in the case of Usama) or an unraveling of the Arab world because of a future breakup of Saddam’s Iraq as causes for the unraveling of the world. Saddam had famously predicted before being hanged that without his strong hand and dictatorship, Kurd, Shia and Sunni Iraqi’s would not be able to govern themselves and that sooner or later, Iraq would unravel. If the Middle East unravels, so does the oil industry that fuels human civilization. So, for now, I referee that the score is still tied. I conclude that 2 Q62, line 2 is dating the times in which the Antichrist dies, when humans and animals are enduring an unraveling of natural balances of the planet. At once there is vengeance? The line saying at once there will be vengeance is openly vague to embrace a future act of vengeance in retaliation to the killing of the Antichrist. One cannot say vengeance actually came from supporters of dead Saddam, although the worst years of the Iraqi sectarian civil war were ahead with the highest death tolls on Iraqis and US-coalition forces in the crossfire. Today saw the first reprisal bombings for Usama’s killing by Pakistani Taliban elements allied to al-Qaeda. Two suicide bombers killed scores of Pakistani Special Forces trainees as they gathered outside their boot camp facility in Western Pakistan to climb onto buses and minivans for a holiday. The death of 80 and the wounding of 100 of these does not fit the horrific reprisal implied that could ally 100 nations into an international counterattack. So, we are still waiting for something bigger to take place, perhaps in America — perhaps on or around the 10th anniversary of 9/11, or in al-Qaeda’s other favorite month to strike, the 11th month of each year. Now, if line 3 of 2 Q62 and part of line 4 are implying an alliance of 100 nations taking vengeance on a history changing terrorist act, then I have to give Usama a point. After al-Qaeda’s hijacked jet takedown of the World Trade Center Towers and drilling of the Pentagon on 11 September 2011 — a terrifying crime dated and foreseen by Nostradamus, see Osama — President G. W. Bush collected 100 nations into his alliance to seek out and destroy Usama’s terrorist network. Shortly after, in a few months’ time, US forces and the Afghan Northern Alliance routed al-Qaeda and the Afghan Taliban regime that harbored them in Afghanistan. Usama and his surviving core of al-Qaeda were surrounded in caves on Mt Tora Bora. The survivors, including a wounded Usama, only just managed to sneak over into Pakistan where he spent nearly a decade in hiding, overseeing a greatly reduced and crippled al-Qaeda. The last line of 2 Q62 returns to the theme of describing the times of the death of the Antichrist: a time of great climate disruption (thirst=drought), the crisis of potable water and famine looming for the an overpopulated world that will endure the birth of the 7th billionth thirsty and hungry child sometime around July of 2011. One might argue that this population milestone tilts the milestone in favor of Usama, however the climate has been unraveling since global temperatures spiked and kept spiking from 1998 onwards, including the year Saddam was hanged in 2006. So, no score change. I will save the comet milestone at the end of 2 Q62 for last. Let us jump to the next quatrain. We see in line one of 8 Q77, how it links the annihilation of Mabus to the annihilation of the “Third Antichrist”. They are one. The chemical weapons plume over Halabja, Iraq. Let us jump ahead to the verse’s final line. The blood-soaked human bodies and the reddened icy or white spotted rain on the hemorrhaging bodies is a phenomenon seen on those killed by biological or chemical agents. 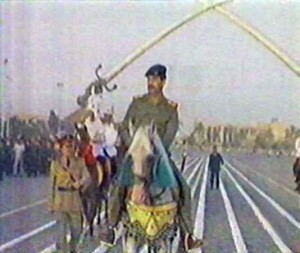 Although a reprisal for Usama’s death may use these agents, clearly, Saddam scores one here because he notoriously used such weapons against the Kurds in 1988 in Halabja, killing thousands of civilians and on Iranian soldiers during the Iran-Iraq war perhaps killing and crippling 100,000 of them with mustard gas. Now to 8 Q77’s line 3. This one leans in favor of Usama. He and his al-Qaeda jihadists are each considered by a vast majority of Muslims around the world as Al-muhartik (heretic). Since 9/11 to the present, most of the leading al-Qaeda planners, the cream of his suicide operatives who committed the act and thousands of AQ foot soldiers have been eliminated (dead), exiled from their countries of origin and made captives wasting away in a network of prisons far from home such as the US concentration camp at Guantanamo, Cuba. 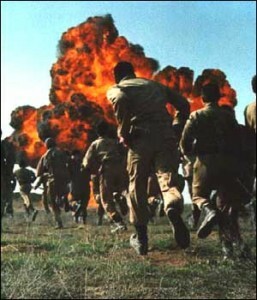 Iranian human wave attacks during the Iran-Iraq War. Saddam fulfills this. The time he was made dictator, to the time he was hanged was 27 years of constant warfare for Iraq. Saddam waged a civil war with the Kurds living inside its borders as well as crushing a second Shia uprising in 1991, killing hundreds of thousands. Saddam initiated the Iran-Iraq War (1980-1989) killing a million people. He invaded Kuwait in 1990. He was thrown out of Kuwait with the loss of 150,000 soldiers killed and hundreds of thousands captured in the Persian Gulf War that followed in 1991. A low-grade war smoldered from 1991 to 2003 with US-Coalition patrolling a “No Fly Zone” over Iraqi airspace with occasional volleys of cruise missiles crashing into Baghdad in the mid and late 1990s. Then the US invaded Iraq in 2003 deposing Saddam’s regime. The Baathists fought a guerilla war with US occupiers then as Sunnis they grappled with the Shia in a bloody sectarian civil war at the time Saddam was hanged in late December 2006. A period of wars and civil wars that spanned exactly 27 years! New revelations have reached me today, which I have verified. Usama, back in 1984, established MAK (Maktab al-Khidamat) with Abdullah Azzam, an organization to raise funds and recruit a foreign legion of Arab mujahedeen fighters, mostly Saudi Arabs, to aid the Afghani mujahedeen’s guerilla war against Soviet occupiers of Afghanistan. Although Usama had been funding and fighting alongside Afghans since he completed college in 1979, MAK put Usama on history’s time map as a leader in a war — just the kind of prominence that a prophet from the 16th century would have recognized. In 1984, Usama’s bloody war began, first with the Soviets, and then four years later, MAK became the foundation for creating and fundraising and recruiting al-Qaeda. Usama’s war shifted from Soviets and became a guerilla-terrorist war against Arab dictators, the Saudi King beholden to Western “Crusader” powers with a string terror bombings in the Middle East during the 1990s, as well as the first World Trade Center bombing in 1993. Then came dramatic, large-scale swipes at US embassies in Kenya and Tanzania in 1998 killing hundreds and wounding thousands. Then the USS Cole bombing at port in Yemen in 2000 killing and wounding dozens of US Navy personnel. One of the 3,000 victims of Usama bin Laden on 9/11. Then came his bloody war’s greatest terror act, the 9/11 toppling of the World Trade Center twin towers and setting alight the US Pentagon with hijacked civilian airliners killing 3,000. This lead to US occupation of Afghanistan in a war spanning nearly a decade, killing over 50,000 civilians and combatants from all sides. The drone wars over Western Pakistan commenced, killing hundreds more. The war in Afghanistan spilled over into a conflict between Taliban Pakistani guerillas with the Pakistani Army adding thousands to the butcher bomber’s bill. Then Usama’s blood war ended with his death by US Navy Seal bullets just a dozen days ago. Usama’s bloody war lasted from 1984 to 2011. That is also 27 years! If we factor in how Nostradamus uses comets as portents, the most obvious allusion is not some comet we see in a telescope. It must be a great comet, one that is seen clearly with the naked human eye, like the one, for example, he successfully foresaw describing events in the future French Wars of Religion that could only happen under the unearthly glow of the great comet of 1577. The early morning hours, just before the hanging of Saddam saw for the first time to the naked eye what would become the brightest comet in 60 years, Comet McNaught. There is no similar comet of singular brilliance seen by the naked eye at the death of Usama. I know, I know. The emails will come flooding in about Comet Elenin, but it is not visible to the naked eye and will only become a visible smudge with a tale in late summer. No big light show like McKnaught is expected. Yes, as it approaches the Sun it has been part of some pretty significant, and perhaps more than coinciding, surprises. As I detailed in my last blog, see Nostradamus, every time Elenin lined up with the Sun and Earth, there has been a significant earthquake on that day: the Chilean quake and Pacific Tsunami in February 2010, the Christchurch temblor in New Zealand, September 2010 and the Japanese quake and Pacific Tsunami of March 2011. There will be two more opportunities for Elenin to trigger quakes of global significance come this September and November. If Elenin achieves a 5 and 0 on significant seismic events and tsunamis before it slips out of the solar system after November, then it could be considered the Mabus Comet and Usama bin Laden would score one on Saddam as Antichrist candidate number one. However, for now, I have to give a point to Saddam, because the comet allusions Nostradamus uses in other visions fits with this as a visible heavenly portent of the death of Mabus. I have a new blog about prophecy and Meditation planned next. I will return to this “Antichrist, new Nostradamus revelations” theme sometime next week, current events willing. That is why it is good to join my free bulletin list and enjoy what thousands of others on the list receive: first notice of when a new blog is posted. Often these quickening times can upset and delay my planned postings with equally interesting new developments in prophecy’s take on our times. The bulletins will help me help you pick up the threads of this and any other series I mention that may not hit the blog page as originally planned, but later on. In that final blog on “Antichrist, new Nostradamus revelations”, we will see how the death of Usama bin Laden casts an entirely new light on the fate of Gaddafi. He is to die soon from a “dart” or “missile” not long after the death of bin Laden, it would seem, if one were to take a refreshed post-Usama-mortem review of the famous anagram prophecy Adaluncatif. See how it translates into Gaddafi Luna (Luna stands for crescent [of Islam]). Read also how Nostradamus’ Gaddafi riddles about the sea have been fulfilled by Usama bin Laden tying their fate in death together. PS–We are in the fifth month of 2011. 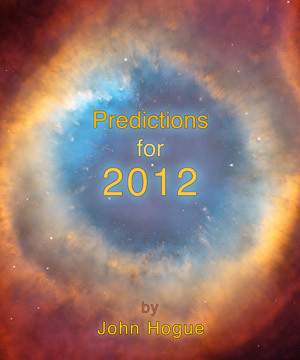 Read how startlingly accurate Predictions for 2011 have been so far.